It is only by chance that this café got reviewed. While walking from the impressive Rennie Gallery, my friend from Toronto pointed out this hidden gem. I scoffed at the cheesy name (and anyway, what can a Torontonian know about the Vancouver coffee scene?) and was mildly repulsed by the view of their vitrine, filled with Vitamin Water. 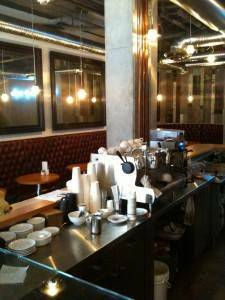 After doing some research, I found out that Everything Café – opened earlier this year – is the first coffee shop by the successful owner of Salt Tasting Room, The Irish Heather and Salty Tongue – no surprise that it exudes an air of know-how and nonchalant smoothness. 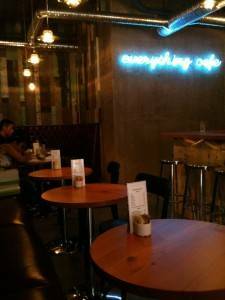 Ambiance: This place is truly “cool” – polished concrete floors, unfinished wood counters and walls, exposed ceiling ducts… neat decorations behind the bar include a Mao bust, Tin Tin, Buddha, beautiful wall décor and mirrors. The menu looked amazing – daily soup, delicious-sounding sandwiches, delectable-looking pastries (goat cheesecake, banana chocolate bread pudding… none of the usual bores triggering flashbacks to BC Ferries cafeteria “desserts”), cheese and charcuterie plates with artisan condiments and baguette – this place has some class! (And it’s licensed – a rarity for a coffee shop – serving wines and interesting obscure beers such as Mirror Pond Pale Ale from Deschutes Brewery in Portland). Coffee: Although I may have not lucked out with the barista (who laughingly admitted she is not the best one in the house), I was quite pleased with my cappuccino. It could be due to the exquisite beans from Stumptown Roasters, which are brewed and sold at only very few places in Vancouver. I definitely look forward to following up on this place and seeing how it grows and becomes more consistent. And next time I’ll come with an appetite for sampling the menu! Price: Amazingly reasonable – Cappuccino $3.05, espresso $2.50. 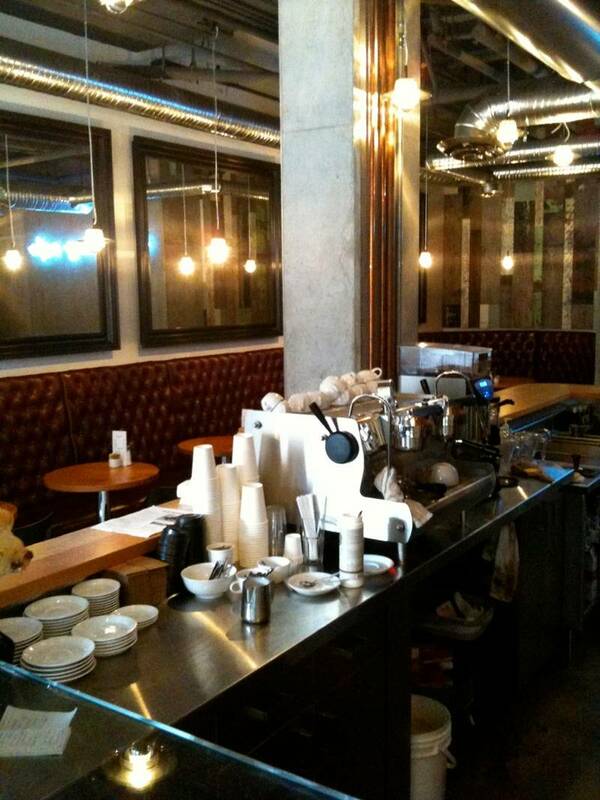 This entry was posted in dining and drinking and tagged Vancouver coffee shops. Bookmark the permalink.